Aussie amplifiers are a small company located in Tasmania and run by Anthony Holton. They produce a range of power amplifier modules, power supplies and other related products, all aimed at the DIY audio community. At the moment there's no completely built version of any of these products available, but Anthony has told me that he is working on that. Anyway, we here at TNT Audio know how to handle a soldering iron, so this shouldn't be a problem for most of us. The aim of Aussie amplifiers seems to be to create 'high-end' DIY modules, if such a thing exists. Both build quality and sound quality are claimed to be the first priorities. The HPA-LSP400se module under review is a mos-fet based design and develops 200 watts into 8 ohm and 300 into 4 ohm, so should be a very capable design able to drive most real world loads without any problems. The modules come ready built, but without power supply or heat sinks. They do have a speaker protection circuit and seem to be built to a high standard with very good quality components like classy Elna Cerafine and Silmic capacitors. And if 300 watts isn't enough for you then Aussie amps actually has a module that claims to be able to deliver a cool 1200 watts! I didn't really want to start building a complete amp myself yet, because I had no idea if I would like the modules, so I asked if I could have a listen to a completely built example. This was send to me by an associate in the UK and utilised a switched mode power supply. This power supply is available from Aussie amplifiers, but Anthony Holton told me that the linear power supply unit actually sounds better. The case was very basic, but functional nevertheless and everything worked very well during the review period of about two weeks. 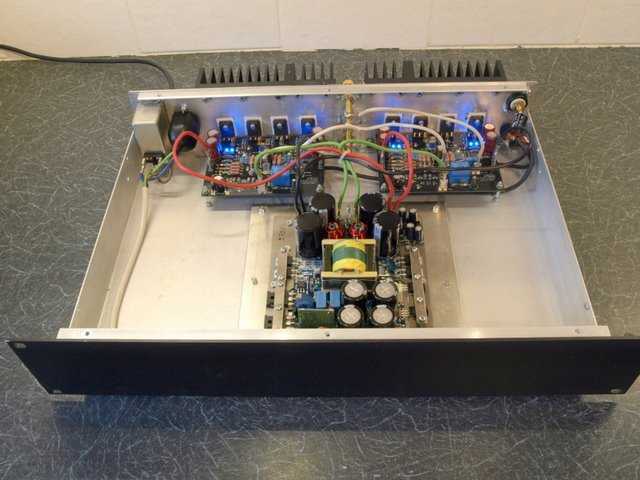 You do have to realise that Aussie amplifiers actually don't do complete kits, and you will have to find a case, heat sinks, a transformer and most connectors, cabling and switches yourself anyway. 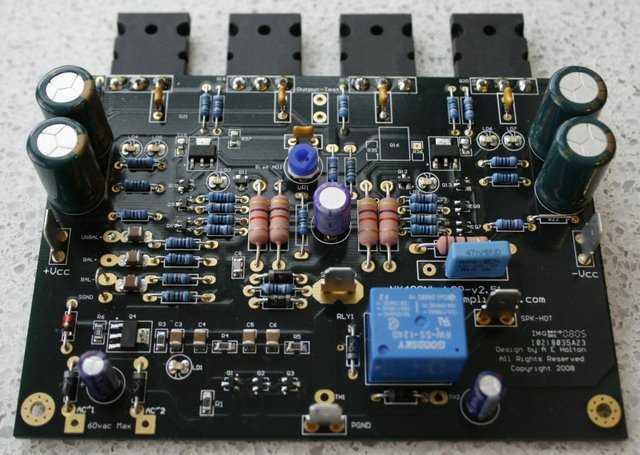 The total cost of building a complete amplifier using these nx400 modules could come to about £800 - £900 in the end, which does put it in a highly competitive part of the amplifier market. The sound I was listening to could be different from the sound you will get, as we all know that the power supply plays an important part in the final sound of an amplifier. Even when using one of Aussie Amp's linear power supply modules there would still be more than enough room for all other parts, like the transformer, to have an effect on sound quality. So, my opinion of the sound of these modules is just based on the particular implementation that was available to me. On the other hand, you cannot make a bad amplifier sound good by using a fancy power supply, so the results are certainly an indication of what is possible with these modules. The amp was all burned in, as it had been used for several weeks already, so I could start listening to it without having to go through the, sometimes, difficult teething problems associated with brand new equipment. Installation was no problem at all and the amp was very happy being driven by my Django transformer preamp. The CD player used was my Astin Trew At3500 with EAT valve upgrade. There's no denying that this sounds like a big amp, that much is clear immediately. The sound is big and powerful and the amp had no problems at all extracting high sound levels from my Dynaudio Contour 1.8 mk2 speakers. The overall character is warm, but the tonal balance is still neutral enough. The amp sounds relaxed and in complete control. Bass is excellent, although not as tight as the Creek Destiny which was also present at the time. The amp still sounded solid enough, though, and actually had a very pleasant overall sound. The top end is sweet and ever so slightly soft, erring more on the side of musicality than analyses. The mid range lacks a little bit of resolution, with fine detail being smoothed over slightly, but also has a pleasant hint of richness. The sound stage is deep, big and with good focus, but everything is well behind the speakers. This amp cannot be called forward by any measure and produces a natural sounding mid to back hall perspective. Rhythm and pace were good, with the mid to lower parts of the spectrum providing most of the propulsion. It certainly made my foot tap, and I'm sure it will make a fine party amp when asked to do so. Overall this amplifier seems to be an excellent compromise with no obvious flaws and a few really strong point. Important is that it can be listened to for hours without causing fatigue or other irritations, and that it can be expected to work well with a wide range of speakers. Just remember that its character is quite laid back. This is one of those products which, even if not perfect, is still difficult to criticise. It is certainly excellent value when compared to commercially available amps, but I do have to say that it seems a little bit expensive for DIY modules. I do suspect that the very bad current exchange rate for the British pound is mostly responsible for this. Please check the price in your own currency to verify. It might be a much better deal when you're buying in Euros, for example. I very much enjoyed my time with this particular amplifier, but the sound quality of these modules will obviously depend on the power supply that is going to be used with them. The amp as it was available to me did sound very good for the money and is very powerful on top of that. Resolution and speed could perhaps be a bit better, but overall this is a very enjoyable amplifier and I can only recommend it.